The design is a very important feature. However, you need to have both functionality and features that allow fans the chance to make contact with you or find out the information about the team or the sports person you are interested in presenting. Furthermore, these characteristics can be crucial when it comes to social engagement options as well as fixtures and sections for league tables. Even though it is hard to narrow down the available choices, we are here to present you some of the best sports themes available. 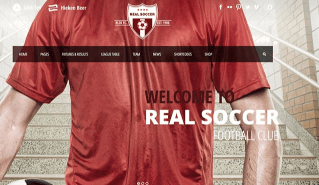 This is one of the greatest sports magazine themes customized to fit soccer-based websites. Its design uses big, bold images which are ideal for showcasing team and players´ photos. It is consistent regarding color, and it has minimal design complemented with great typography. Furthermore, considering functionality, this design is fully stocked, and it has the possibility to provide detailed player profiles, as well as league standings tables, results, and fixtures. This is a bright and fresh theme which is an excellent choice for sports site as well as social and non-profit organizations. It has a responsive design, and it is also equipped with retina-ready graphics. It also provides a clean and simple navigation bar which can be a very important feature for your site´s visitors. Sport is also flexible and modular and allows many header and layout variations as well as two predesigned skins. Furthermore, the design also offers an unlimited choice of colors and fonts. Sport comes with 16 widgets and six plugins which can be a helpful addition. Another soccer related theme you can use is WP Soccer which can be a fantastic way to compel fans to attend the next match of your team. It has two predesigned homepages with six color styles. It also includes plugin which is great if you want to add some player lists and fixtures as well as league tables. Furthermore, it also includes Visual Composer plugin with an add-on to display a countdown timer showing the next fixture. In addition, you can also choose the Themeum Poll plugin which helps to create fan polls. That way you will allow your supporters to have a direct connection with the team. This is a premium WordPress theme which offers a unique design ideal for an international audience since its content can be translated into many languages with the help of WPML plugin. Therefore, you will be able to make a connection with the fans that are not speaking your language. Sporty allows a fantastic choice of colors and Google Font support as well. There is also a new feature which allows you the opportunity to add your YouTube username which would make your videos and playlist automatically imported. The theme is also fully responsive. This is a fantastic choice of theme as well. It includes a large navigation menu, full of media content as well as many plugins such as bxSlider, FlexSlider, Nivo Slider and Revolution Slider. There is also the Mega Menu plugin. 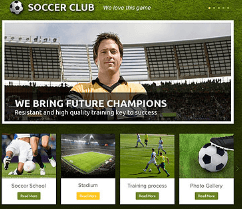 This theme focuses mainly on the teams, players as well as their upcoming fixtures. There is also a fixture countdown timer as well as the Event Manager plugin which shows your upcoming fixture, inviting fans to come. Furthermore, you can upload full-width video backgrounds where you can show some most notable successes of your team and players like touchdowns, slam dunks or interceptions. This is an excellent theme if you want to make a site for a particular team or league. It includes large fonts and two slider plugins such Layer Slider and Revolution Slider. Furthermore, the theme includes Visual Content Composer plugin. With combinations of colors and hundreds of Google Fonts, you can create the relatively unique site. 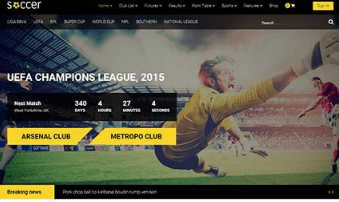 Sports Club also offers parallax scrolling background images and can present all your news and team information in a simple and modern way. AllStar like many other sports themes provides fixtures, league tables, and player profiles. However, it also allows you to focus on the marketing of your team. Give your visitors a call to action with the Revolution Slider plugin and add the CleanTabs plugin which can help you create FAQ sections. AllStar also includes 40 different options for customization of a header as well as the Final Call CSS plugin. There are over 700 web fonts and an amazing color palette.